Light Weight COVER with more rigidity and firmness than regular paper weight. 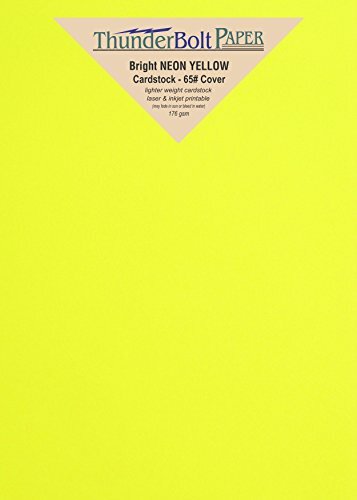 This 65# Cardstock Cover is twice as thick as a sheet of 24# printer (60# text) paper. Just over twice as thick as a 20# copier bond paper. Equals 80 lb bristol and 97 lb index. 176 gsm (grams per square meter). Calipers at .01 inches. Blank and PRINTABLE smooth finish. Bright paper stocks print well with most ink jet and laser printers. The intensity of bright paper colors do change the printed ink colors because inks are not completely opaque. Discover some interesting effects when printing colours on brights. ARCHIVE FRIENDLY Acid-Free and Lignin Free Recycled paper with 30% post consumer recycled, as good stewards of the environment and with document preserving characteristics. Note that colors can look different on different monitors. THOUSANDS of HAPPY CUSTOMERS have appreciated the quality paper we provide as well as the good service we offer. With over 30 years in the paper business, we have experience printing on, folding, cutting, stapling, and assembling lots of high quality papers. We are always eager to answer questions so you get the right paper for the right job. Our GUARANTEE: We are so confident about the quality of our paper that we offer you a 30 DAY MONEY BACK Guarantee.